Mass Media Bunk is a commentary on articles in the mass media that provide false, misleading, or deceptive information regarding scientific matters or alleged paranormal or supernatural events. September 13, 2001. 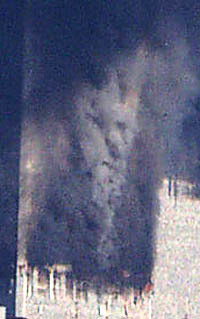 Many are claiming they see the face of Satan in an associated press photograph by Mark Phillips of the billowing smoke at the World Trade Center. If you look closely, at the bottom you can also see Jerry Garcia playing the guitar. Above Jerry is either an ancient Assyrian or Mycenaean warrior. On the warrior's shoulder is a replica of the face on mars. On top of the head of the face on mars is Cartman of Southpark, tipped on his side or possibly it is a ring in the nose of a figure that resembles an earless George Bush or Robert Bork. Then again, this could be Satan. Or it may just be another case of pareidolia brought on by daemonophilia (excessive obsession with spirits). crowd." Some would say that this interpretation could be an example of shoehorning, but they would be wrong. They obviously did not heed the warning in such lines as "There's a black Mercedes rolling through the combat zone, Your servants are half-dead, you're down to the bone," "I see pieces of men marching, trying to take heaven by force," "In the valley of the giants where the stars and stripes explode," and "Begging God for mercy and weeping in unholy places." How much more proof could anyone ask for? note: Mark Phillips, who took the "devil in the smoke" photo, has photos of the World Trade Center in all its glory for sale at his website. He is donating much of the proceeds from the sale of these photographs to the Twin Towers Fund. September 4, 2001. It used to be that the front page of the daily newspaper in a major metropolitan area would be devoted to newsworthy stories. Even today, when the tabloids have taken over both print and video journalism, the front page junk news is usually about something new. Not today. At least, not in today's Sacramento Bee. Today there are five stories on the front page of the Bee. Hewlett-Packard plans to merge with Compaq and become almost as big as IBM. A shark kills another swimmer on the East Coast. Enrollments at the local campus of California State University are swelling as a new school year begins. Our governor sponsors a charity that benefits children but is open to abuse by both the governor and contributors. Most people would agree that those are newsworthy stories. The fifth story on page one is tucked in the lower right hand corner and has the headline: Web site gives scientists outlet for explaining the unexplainable. The byline is Edie Lau, Bee science writer. The story isn't about science but about a few people who are being catered to by Charles Tart, "a leading expert on parapsychology." Tart started a web site over a year ago called TASTE, The Archives of Scientists' Transcendent Experiences. We didn't think much of Taste last year and why the Bee considers this front page news this year is beyond me. Gary Condit must have given another bad interview and surely that should have been on the front page. We have written about Tart's so-called expertise as a scientist and parapsychologist, so we won't beat that dead horse again. Consider the headline and the byline of today's story. You would think the story has something to do with science. But science isn't in the business of cataloguing or explaining transcendent experiences (except by neurologists)* nor is it in the business of "explaining the unexplainable." If it is purely subjective or non-empirical it is not a matter for science. Yet, Tart continues to complain and whine about the fact that some scientists are afraid of being laughed at or fired should they reveal to their colleagues that God talks to them in a secret language or that they frequent alien spaceships or that the Virgin Mary appears to them every Friday the 13th. So he created a haven for these persecuted scientists, a place where they can anonymously and safely tell the world about their transcendent experiences. What he complains about is that scientists are not allowed to bring into their scientific work the stuff of their extra-scientific lives: their religious beliefs, their paranormal experiences, their transcendent ecstacies. Really? Do religious people complain that they are not allowed to bring in their scientific beliefs and practices to their churches, chapels, synagogues, mosques, etc.? If they did, who would listen to them? So why is anyone interested in Tart's complaint? On the front page of his "online Journal," Tart claims that there is a stereotype that "real" scientists don't have spiritual, mystical or psychic experiences. Is this a stereotype or a personal delusion? Real scientists who write books about such things are can't-miss authors and guests on Oprah, Larry King and the other tabloid talk shows. Where has Tart been the past few years? He should read the latest issue of the Skeptical Inquirer (vol. 25, no. 5, September/October 2001), a special issue on Science and Religion. He should read it not for the main articles, since they all maintain that science and religion should be separate endeavors, but for the references they make to recent popular books on religion by scientists. Hasn't he heard of John Mack, the Harvard professor and author who believes in alien abductions? Courtney Brown is still at Emory University, despite his constant dabbling in the transcendent and paranormal. Hasn't Tart followed the success of scientist-authors like Michael Behe, William Dembski, Robert Jastrow, Leon Lederman, Frank Tipler, Paul Davies, et al.? Does he know nothing of the "real" Templeton Fund? or the PewForum? He certainly knows about the Fetzer Institute and the Institute of Noetic Sciences, since he gets money from them. Whether he is feigning ignorance or not, Tart himself is trying to get on the bandwagon of Scientists Promoting Occult or Kooky Stories (SPOOKS) with his latest book called MIND SCIENCE: Meditation Training for Practical People. The so-called Journal that Tart has created is typical of his sloppy scientific work. The web site is simply a chat room where anyone can post a story. Tart has no way of knowing whether the people who write the stories are who they say they are or whether the stories are accounts of personal experiences, confabulations or pure fiction. I suspect he doesn't care. His real purpose seems to be propaganda for his personal delusion that he and others like him are persecuted for their weird beliefs. 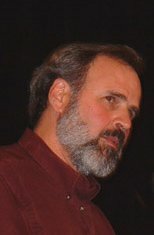 Anyone who has followed the pages of the Skeptic's Refuge and Dictionary for the past seven years knows that weird beliefs are honored in our society and that, if anything, scientists who espouse weird beliefs are likely to find their status elevated rather than find themselves needing an outlet like Charles Tart's unscientific journal. The good, though old, news is that Tart is retired and is no longer feeding at the public trough (UC Davis, where he was a member of the psychology department for some 25 years). He now wastes the money of private donors who sponsor his Institute for the Scientific Study of Consciousness as he continues his quixotic quest for an altered state of being and a life without bureaucracy. August 22, 2001. The Utah State Bureau of Criminal Identification (BCI) "thought it would be interesting" to look at the statistics they gather and check them against a few "urban legends." They may have had some fun, but in the process they have just muddied the waters regarding evidence for belief in the full moon being a causal factor in criminal behavior and domestic violence increasing significantly on SuperBowl Sunday (SBS). Not content to confuse the issue on these two topics, BCI added a third: according to their data, Mother's Day is almost as bad as SBS for violence against women by men. According to BCI, a mother is three times as likely to be assaulted by a man on Mother's Day as on any other day of the year. To their credit, BCI notes that their data can't even justifiably be applied to the entire state of Utah because more than half of the law enforcement agencies in the state don't supply the kind of reports that their "study" is based on. Fifty-seven of 111 reporting agencies did not participate in their Incident Based Reporting (IBR) program (see page 8 of their report for an explanation of IBR). This fact is not mentioned by Pat Reavy, who wrote an article for Deseret New.com entitled "Moon shines on crime- Full moon tied to hike in most types of crime." Reavy does note that one of the eight categories studied by the BCI, homicide and manslaughter, had reports of only a small number of cases in the past five and one-half years. By defining 'day of a full moon' as "the day before, the day of and the day after a full moon", the BCI was able to conclude that since 19 homicides or manslaughters occurred during a full moon and an average of about 5 on other days, there was a "startling" difference. Not quite. This means that over about 214 days (13 full moons * 3 days * 5.5 years) there were only 19 such crimes or an average of 0.09 crimes on full moon days versus 0.05 on other days. With such small absolute numbers, these relatively large percentage differences don't seem to be very significant. For example, if they had counted only the day of a full moon as a day of a full moon (instead of the day before, the day of and the day after) there would have been no manslaughters on the day of the full moon and they would not have gotten the "startling" result of a 220% difference. If nothing else, this kind of study makes it obvious why national rather than local surveys of crime data are essential to truly understanding whether there is anything significant about the full moon and its relationship to crime. In their report [pdf file, pp. 11-12], however, BCI baldly states: "There is more crime during a full moon." The difference between full moon days and non-days is 1.5 (or 2.86%) more crimes on full-moon days. The claims regarding the SuperBowl ("There are more domestic assaults on Superbowl Sundays") and Mother's Day ("There are more domestic assaults on Mother's Day") are even more confusing because the report does not give the absolute numbers of assaults. The report is in average assaults per day. The average of 5 is given for assault on a wife on SBS; the average for other days is 4.4. I would think that SBS should be compared to all other Sundays, or Saturdays and Sundays, rather than to all other days of the week. Weekends may be significantly different than weekdays for domestic assaults. The BCI itself speculates--no, they call it a "no brainer" according to Reavy--that men drink excessively on SBS and that's why they are more violent on that day. If that were true, by the way, then New Year's Eve should be the most dangerous eve of the year for women, and a close second would be St. Patrick's Day. Yet, I've never heard anyone claim either of those days are particularly dangerous for women. Anyway, if there is any truth to the more alcohol means more domestic violence, I suggest that it's likely men drink more on the weekends than on weekdays--though I have no proof of this, except a few anecdotes, which seems to pass muster often enough in this arena. Mother's Day is on a Sunday, too, of course, and I think it also should be compared to other Sundays or holidays rather than to all days. It is hard to use the BCI data to compare Mother's Day with SBS because they use different categories. Both use common-law wife and wife, but the SBS data uses 'girlfriend' and the Mother's Day data uses 'mother' as a category. On SBS there are an average of 5 assaults on the wife; on Mother's day there is an average of 5.8 assaults on the wife. The average day sees 4.4 such assaults. Again, without knowing the absolute numbers of these assaults, which I suspect are fairly low, these differences may be very insignificant. I would not want to conclude from this data that a wife has a 16% greater chance of being assaulted by her husband on Mother's Day than on SBS. On SBS there is an average of 1.6 assaults on common-law wives; on Mother's Day there is an average of 0.04 assaults on common-law wives. The average day sees 0.06 common-law wives assaulted. Without knowing the absolute numbers, I don't know what to make of this data. I certainly don't think they justify concluding that a common-law wife is 40 times more likely to be assaulted on SBS than on Mother's Day. According to BCI, 6.8 girlfriends are assaulted on SBS, compared to 3.8 assaults on other days. Again, I'd like to see the SBS stat compared to all other Sundays, or Saturdays and Sundays. I'd also like to know what the absolute numbers were so I could better judge whether this difference is significant. BCI tells us that a mother is three times more likely to be assaulted on Mother's Day as on any other day of the year. Of course, men may be three times more likely to be with their mother on mother's day than on any other given day. On the average day, a mother is no more likely to be assaulted that a common-law wife (0.06 per day). But on Mother's day men must leave their common-law wives to go assault their mothers; for, the assault rate goes down for common-law wives on Mother's Day. By the way, BCI doesn't blame alcohol for the violence on Mother's Day. It is "tension" and "stress" due to "dealing with split families or divorce situations," according to Rob Hall, a police detective. * I wonder if he knows this "intuitively." He may also be the one who said, "It's a good thing Superbowl Sunday isn't on Mother's Day." I wonder if this study was done during a 3-day full moon. August 13, 2001. Last night, while channel surfing the wasteland of cable television, I was rewarded by Black Entertainment Television (BET) and MSNBC. The former featured Peter Popoff and his wife giving away holy water from Russia in exchange for personal information on how to contact you. They were doing the faith healing shtick exposed by James Randi years ago. Popoff calls Randi a false prophet and a deceiver and justifies his continued fakery by claiming that "Thousands upon thousands of people around the world have found Jesus Christ through this ministry." Despite Popoff's obvious fraud, no charges have ever been brought against him, which is rather typical in this country. So-called "faith healers" have been given a free ticket by law enforcement to bilk anybody in the name of Jesus. The only other group that enjoys such special treatment in this country are the telepsychics like Miss Cleo. Ordinary "psychics" who practice the fine art of grifting are often arrested for conning gullible people out of their jewelry or life savings. The other reward I got last night was a re-run (4th or 5th time) by MSNBC of their program on exorcists, featuring Tom Brown and Bob Larson. Their game is to bring troubled people together and look for demons that are causing the trouble so they can exorcize them. MSNBC, in an effort to discourage people from trying this at home, slipped in a couple of clips of people being arrested for botched exorcisms in which they have done such things as smothered children and beaten women to death--in Jesus' name, of course. Brown and Larson have never killed anyone, as far as we know, but whether they help or harm people was not possible to discern from the program, since the "reporters" did no background checks or follow-ups on the people exorcised. They could have been mentally ill, actors, mentally ill actors, drug addicts, mentally ill drug addicts, or they may have been possessed, as the exorcists claimed. All the participants shown being exorcized seem to have seen the movie The Exorcist or one of the sequels. They all fell into the role of husky voiced Satan speaking from the depths featured in the film. But wouldn't a real journalist get a second opinion? Why should we take the word of interested parties like Brown and Larson that their subjects really were possessed and that they really released Satan from all these bodies? They might tend to be self-deceived and be guilty of confirmation bias. Those attending the exorcism sessions of Brown and Larson seemed a very sorry lot, indeed. Even sorrier than those teary-eyed hand-clappers encouraging Peter and Elizabeth Popoff. These are desperate people and one can only wonder what stormy seas set them adrift and brought them to port at the feet of these snarling, drooling faith healers and exorcists. Such pitiful creatures nevertheless always seem to find a receptive audience who believe they are witnessing miracles. I'm shocked that anyone would find the MSNBC program to be an "in-depth documentary" as one viewer thought. The program was superficial, shallow, and apparently produced by cynical people who think viewers can't handle the truth. No effort was made to find out what the truth might be. Instead of investigating those allegedly exorcized, MSNB just re-runs the original program. Randi, James. The Faith Healers (Buffalo, N.Y.: Prometheus Books, 1987). Spanos, Nicholas P. Multiple Identities and False Memories: A Sociocognitive Perspective (Washington, D.C.: American Psychological Association, 1996). "Woman Admits Guilt in Exorcism Death"